Turkish prime minister Tayyip Erdoğan’s AK party has ruled out early elections as tens of thousands of anti-government demonstrators defied his call for an immediate end to protests. Hüseyin Çelik, deputy chairman of the Justice and Development (AK) party founded by Erdoğan just over a decade ago, said local and presidential elections would be held next year as planned, and a general election in 2015. “The government is running like clockwork. There is nothing that necessitates early elections,” he told reporters after a meeting of the party’s executive committee in Istanbul. A few miles away, tens of thousands of Turks defied Erdoğan’s call on Friday for an immediate end to anti-government demonstrations, massing again in the central Taksim Square, where riot police backed by helicopters and armoured vehicles first clashed with protesters a week ago. Tourists and curious locals swelled their numbers around a makeshiftprotest camp in Gezi Park, a leafy corner of the square where activists have been sleeping in tents and vandalised buses, or wrapped in blankets under plane trees. What began as a campaign against government plans to build over the park spiralled into an unprecedented display of public anger over the perceived authoritarianism of Erdoğan and his Islamist-rooted AK party, leading to the worst riots in decades. In a rare show of unity, thousands of fans from Istanbul’s three main football clubs Beşiktaş, Galatasaray and Fenerbahçe, who have helped organise some of the protests, marched on Taksim roaring “Tayyip resign!” and “Arm in arm against fascism!”. There were similar scenes overnight in Istanbul’s working-class Gazi neighbourhood, which saw heavy clashes with police in the 1990s. Three people have been killed and close to 5,000 injured around the country since the violence began a week ago. 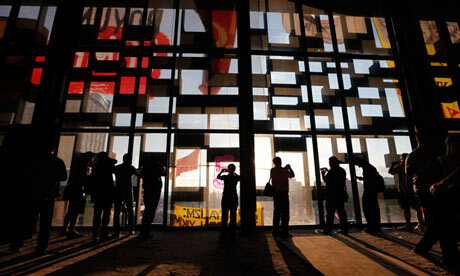 Thousands protested in Berlin, home to a large Turkish population, waving red Turkish flags and chanting “Occupy Gezi”. Erdoğan has given no indication of plans to clear out Taksim, around which protesters have built dozens of barricades made of ripped up paving stones, street signs, vandalised vehicles and corrugated iron, clogging part of the city centre. “Let them attack. They can’t stop us,” a member of the Turkish communist party shouted through loudspeakers to a cheering crowd from on top of a white van in the square. Taksim is lined by luxury hotels that should be doing a roaring trade as the summer season starts in one of the world’s most-visited cities. But a forced eviction might trigger a repeat of the clashes seen earlier in the week. The gatherings mark a challenge to a leader whose authority is built upon three successive election victories. Erdoğan takes the protests as a personal affront. “Turkey is a democracy and it will prove its inner disposition in the face of these protests,” German foreign minister Guido Westerwelle told Germany’s Welt am Sonntag. “Prime Minister Erdoğan has a special responsibility to calm the situation and he has to be aware of that,” he said. Sources close to the AK party speak of a sense of siege within the party leadership, with influential if disparate forces loath to break ranks publicly but worried about the extent of Erdoğan’s power and his uncompromising stance. Erdoğan has made little secret of his ambition to run for the presidency after his third term as prime minister comes to an end, although the AK party could also change internal rules to allow him to stand for a fourth term. Celik said the protests had been discussed “in detail” at Saturday’s party meeting, but that the question of early elections had never been on the agenda. “A government that doesn’t have people’s trust cannot be permanent. We got the message of the protests and we respect that, but there’s nothing to respect about people throwing stones,” he said. Erdoğan has made clear he has no intention of stepping aside – pointing to the AK party’s 50% of the vote in the last election – and has no clear rivals inside the party or out. This entry was posted in News and tagged against fascism, anti-government demonstrations, Besiktas, Erdogan, Fenerbahçe, Galatasaray, Justice and Development, Occupy Gezi, Protest, Taksim Square, Tayyip Erdoğan, Tayyip resign, Turkey on 8 June 2013 .